Ultra Man™ Max is a daily multivitamin formulated for the active man and his nutritional needs. ** As compared to our regular Ultra Man formula, Ultra Man™ Max is packed with higher levels of several key nutrients for men who need more from their multi. Ultra Man™ Max Daily Multivitamins is rated 4.4 out of 5 by 49. Rated 5 out of 5 by Anonymous from Great vitamin Great I highly recommend to all. I feel energetic throughout my day. Rated 5 out of 5 by RJ from My favorite vitamin You feel energy after taking these vitamins. Rated 5 out of 5 by BmoreWebo from 10 Will definately purchase again and agian. Now I am always ready, willing and ABLE. Energy and confidence are off the charts. 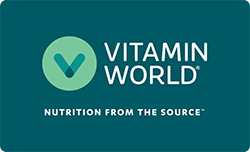 Rated 5 out of 5 by Paul from I have used this product for years Please be aware that other Vitamin World products have been out of stock every time I've tried to re-order. For example, Your "Ultra Probiotic Complex 80 Billion Live Culture" supplement has not been available for months and I'm about to run out. You should advise if a product has been discontinued. Otherwise, you shouldn't allow your company to be out of stock for more than three months.